Did someone say we need yet another anthology of essays? 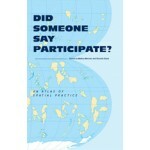 According to the editors of Did Someone Say Participate?, the answer is an emphatic - or hysterical -"YES!" In fact, they'd go further and argue that the shifts that have taken place in the practice and pedagogy of architecture have been mirrored in other fields, and that this has happened to such an extent that an emerging generation of artists, activists, economists, curators, policy makers, photographers, editors (and, of course, architects) is reshaping how we look at contemporary social and political reality. Despite their apparent disciplinary differences, these professionals are all spatial practitioners. What was once seen as the defensive preserve of architects -mapping, making, or manipulating spaces -has become a new "culture of space" situated in the global market and media arena. Did Someone Say Participate? showcases a range of forward-thinking practitioners and theorists who actively trespass into neighboring or alien fields of knowledge in activities that range from collaborative forms of interdisciplinary practice to identifying practices of ethical terror. Did someone say we need yet another anthology of essays? According to the editors of Did Someone Say Participate?, the answer is an emphatic - or hysterical -"YES!" In fact, they'd go further and argue that the shifts that have taken place in the practice and pedagogy of architecture have been mirrored in other fields, and that this has happened to such an extent that an emerging generation of artists, activists, economists, curators, policy makers, photographers, editors (and, of course, architects) is reshaping how we look at contemporary social and political reality. Despite their apparent disciplinary differences, these professionals are all spatial practitioners. What was once seen as the defensive preserve of architects -mapping, making, or manipulating spaces -has become a new "culture of space" situated in the global market and media arena. Did Someone Say Participate? showcases a range of forward-thinking practitioners and theorists who actively trespass into neighboring or alien fields of knowledge in activities that range from collaborative forms of interdisciplinary practice to identifying practices of ethical terror. For the first time, architecture is here presented as the architecture of knowledge. 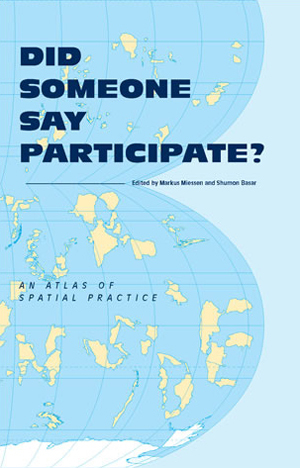 Participation -social, political or personal - is once again at the forefront of research. Together, the contributions form an atlas of spatial practices resembling the early medieval maps that attempt to show the entire known world. Did Someone Say Participate? will be essential reading not only for those involved in the future of architectural research and practice, but for anyone interested in navigating through current forms of cultural inquiry and debate.